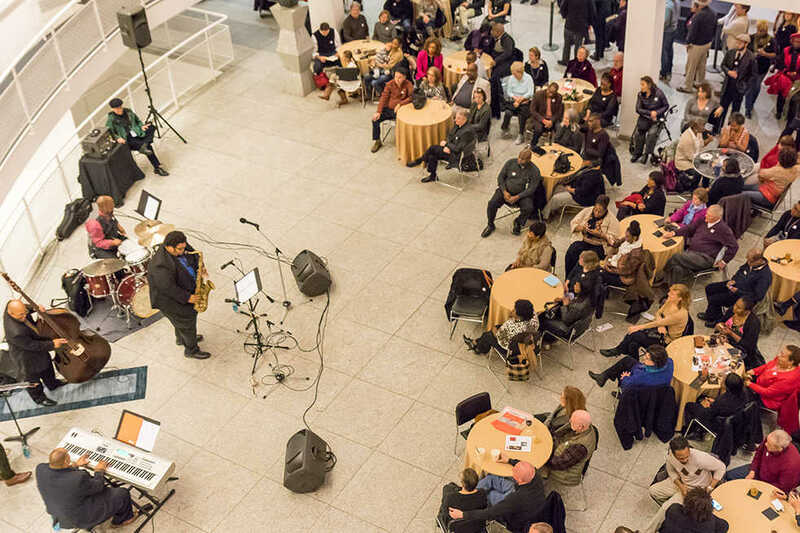 Friday Jazz has returned to the High Museum of Art, retaking the third Friday of each month. From 6 p.m. to 10 p.m., live performers play in the Robinson Atrium while guests crowd around the floors. The event is free for museum members and also free with $10 half-price museum tickets, meaning guests can tour the museum while listening in on the music. The High’s own parking deck is available to park in for $5 but fills up rather quickly. The Promenade across the street provides additional spaces for $10. Jazz used to be the tune of third Fridays until mid-2014 when the program was changed to Friday Night Music Remix, which featured a variety of genres of music. A common criticism was that participants had trouble hearing the music over the din of the large crowd. However, for the Jan. 15 performance, music could be heard from any nook or cranny in the Stent Family Wing. Evidently, the High has resolved this issue in the interim. Although the music is audible now, the performers are not always visible. Several tables and chairs are set up on the lower level, but these are first-come, first-served. There is plenty of standing room in the atrium, but it may be a competition to get a decent view. At the cost of volume and clarity, there are spaces on the upper floors with a line of sight to the performance, though large support pillars obstruct many of these zones. Jan. 15’s Friday Jazz featured Mike Walton, a saxophonist from Atlanta. Having graduated from Valdosta State in Music Performance and from Georgia State with a Masters in Jazz Studies, Walton has played the sax since age 10. He has played at the High thrice before, but that Friday was the first time he brought his own crew: Darren English on trumpet, Tyrone Jackson on piano, Shawboxx Shaw on bass and Chris Burroughs on drums. The group played a variety of tempi, from smooth jazz to fast-paced to rocking out and making sure all of Stent Wing could hear over the crowd. Walton and English played individually, together, or not at all, giving different feels and flows to the music with each interchange. True to the genre, the group added improvisation to their setlist. One might expect the crowd to follow the intersecting stereotypes of “museum” and “jazz,” and there were indeed many older, wealthier guests. However, the college-aged crowd had a strong showing. With the departure of “Habsburg Splendor,” the High has welcomed Iris van Herpen’s cutting edge fashion design in “Transforming Fashion.” van Herpen uses modern technology, such as 3D printing and polymer chemistry to create unique fashion statements. Coming at the end of February are exhibits featuring works from Vik Muniz, a Brazilian photographer and artist who has used electron microscopy in his art and art and rare notebooks from Jean-Michel Basquiat, an American artist. “Transforming Fashion” departs before May 20’s jazz night, but the latter exhibits depart at the end of May. This leaves several opportunities to get the full music and museum experience before the spring semester itself departs.